If you catch Martha Hill in her kitchen waxing lyrical over avocado pears, bananas and pungent herbs, she is far more likely to be concocting a shampoo or a face cream than something for tomorrow's dinner. You exclaim with delight over the beautiful apple blossom in the orchard of her home at Laxton just over the Rutland border. Martha sniffs briskly, tells you it is lovely in hair tonic, and did you know that coltsfoot is good for the scalp? She has been experimenting with herbs and natural beauty products ever since her children were small. She chuckles as she tells you, "Some of Sally and David's earliest memories are of me with herbs, bits of plants and chunks of fruit stuck over my face and hair. We still laugh about my early experiments. Now 68, and a grandmother, Mrs. Hill looks so serenely youthful she must surely be the world's best advertisement for her own theories on beauty care. 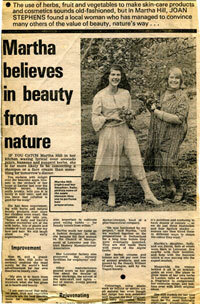 "My aim is to learn from Nature and to improve and maintain what she has given us in health and beauty. "I am convinced that natural plant, fruit and vegetable extracts are the best possible basis for external care. "At the same time, it is also important to cultivate good eating habits - for beauty comes from within." Martha made her name as a fashion designer. In 1952, she became the first woman on the Council of Management of Leicester and District Hosiery Manufacturers' Association. Her Leicester factory also pioneered day nursery facilities for employees' children. Other manufacturers poured scorn on her prediction about the demise of seam stockings, the advent of the mini-skirt and tights - but of course, events proved her right. It was while she was successfully designing high fashion women's clothes in the sixties, that the idea of launching her own range of herbal beauty products began to take shape. It crystallised at a beauty show in Granby Halls. Martha was one of the judges and also on the panel was a journalist friend who wrote about health and beauty, and who put her in touch with a Swiss doctor/chemist, head of a pharmaceutical company. "He was fascinated by my project," said Martha, "and we worked together on the preparations in Switzerland for a long time before they were eventually launched. They are still made there with many of the Alpine herbs." Her herbal creams and lotions are 100 per cent free of animal products, and are passed by the Beauty Without Cruelty League, and by the Vegan Society. Colourings, using plants such as lettuce or nettles are all natural too, even though her range has now extended well beyond the four original, and very successful, items for cleansing, conditioning and rejuvenating the skin. "For the cosmetics, I think it's pointless and confusing to have dozens of colours - so we do just three foundation and four lipstick shades - women can then blend these in different ways to obtain the colour they want." Martha's daughter, Sally, and son David, both of whom were born in Leicester, live nearby with their families, and help with the business which is now moving into the export market. Meanwhile the woman behind it all is as indefatigable as ever. She plans to grow more of her own herbs in Laxton, talks of launching a fragrance to complement her cosmetic range, and bubbles over with fresh original ideas. She still models for her own mail order catalogue and must be the most naturally glamorous grandmother in Britain. 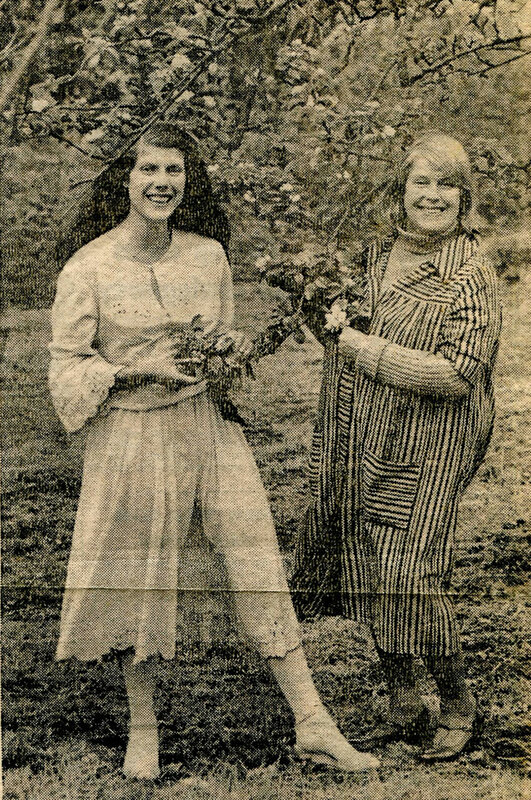 Martha and her daughter, Sally, picking some of the apple blossom they use to perfume hair preparations.